The Martin Luther King Memorial DC - opened in August 2011 - is another fantastic, and newest - historic attraction in Washington DC. Close to the Lincoln Memorial Washington DC and the Jefferson Memorial Washington DC - and of course the Reflection Pool - this new Dr. Martin Luther King Jr. National Memorial will draw the attention of millions of visitors. After 15 years of controversies the 30-foot granite structure is available for the public to enjoy. Located along the Tidal Basin, it is flanked by a crescent-shaped wall inscribed with 14 excerpts from some of King's most notable sermons and speeches. Also along the Tidal Basin you will find the Cherry Trees that blossom every April, the month of Dr. King's assassination (April 4th). Another notable fact: The Memorial's street address, 1964 Independence Avenue, references the 1964 Voting Rights Act, a milestone of the civil rights movement. The official dedication ceremony of the memorial was supposed to happen on Sunday, August 28, 2011, but due to Hurricane Irene rolling up the East Coast and the Mid-Atlantic States, the event had to be postponed until September, maybe even October. As of September 12, 2011 the word is out, that the dedication ceremony will now take place on October 16, 2011. Follow @DCinsiderGuide to stay up-to-date about the new date and celebration details. The Dr. King Jr. Memorial DC focuses on 4 main themes that illustrate the corresponding fundamentals in Dr. King's message: Justice, Democracy, Hope, and Love. 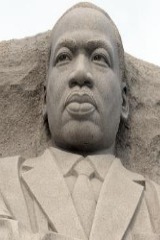 The Martin Luther King Memorial DC is located on the NorthWest corner of the Tidal Basin at the intersection of West Basin Drive SW and Independence Avenue SW, Washington DC. Entrances to the Martin Luther King Memorial DC site can be found at Independence Avenue, SW, West of the West Basin Drive; Independence Avenue, SW, at Daniel French Drive; Ohio Drive, SW, South of the Ericsson Statue; and Ohio Drive, SW, at West Basin Drive. As you may know from other monuments in the area near the Tidal Basin and Reflecting Pool, Parking is extremely limited. It is advisable to use public transportation. However, the closest metro stations are Smithsonian and Foggy Bottom (each of them approximately a one-mile walk). Copyright © 2011-2017 DC Insider Guide. All rights reserved.